Osamu Suzuki, Suzuki's CEO, showed off the Swift last week in Tokyo and said the strength of the yen will have a “very big impact” on Suzuki's profits. Suzuki has delayed the relaunch of its Swift small car in the United States until next year while it works on a global product strategy with Volkswagen AG and ponders the growing strength of the yen against the dollar. The rise of Japan's currency already has forced Suzuki to slash its overall U.S. marketing budget. The Honda Fit-sized Swift, pulled from the United States after the 2001 model year, was scheduled to return this fall. But plans were put on hold after Volkswagen bought about 20 percent of Suzuki this year, said Steve Younan, head of product development and business development at American Suzuki. 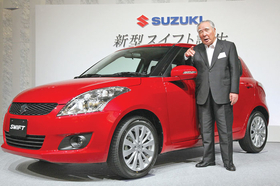 The Swift now is expected to debut in 2011, but Suzuki has not been more specific. The redesigned Swift debuted in Japan last week but will be sold only there and in Europe for now. Younan said that engineering changes to the U.S. Swift were nearly complete and that the company was pondering pricing when work on the project was frozen after the VW deal. He said the Swift's delay is part of a broader review of how Suzuki and VW plan to align product strategies. By the end of the summer or early fall, Younan said, "We should get some indication of where they may have found some efficiencies in platform development and powertrain development." At that point, he said, a green light could be given to the Swift in the United States. But U.S. pricing of the vehicle is likely to be affected by the rising yen. A Suzuki spokesman in Japan said any delay in the Swift's U.S. arrival has more to do with exchange rates than with VW. "At the moment, if the exchange rate continues like it is, we couldn't expect very much profit," spokesman Takuma Mizuyoshi said. "So that's a concern right now." The strong yen has led American Suzuki to slash its marketing budget. "That's been the biggest sacrifice [resulting from] the yen-dollar relationship," said Younan. He said the marketing budget was the primary area in which American Suzuki could cut costs. Coping with the strong yen by increasing prices or cutting content was out of the question, Younan said. "If we had to raise our prices, it would be obscene," he said. Younan did not provide numbers for Suzuki's marketing spending. According to data from TNS Media Intelligence, the company spent about $3.9 million during the first quarter of 2010, compared with about $14.9 million in the same period of 2009. The recent cuts follow a broader reduction in advertising spending at American Suzuki since U.S. sales peaked in 2007 at more than 100,000 vehicles. That year Suzuki spent more than $103 million on advertising , compared with just $26.9 million in 2009, according to TNS Media Intelligence. Suzuki's U.S. sales topped 100,000 in 2006 and 2007 but fell to 38,689 in 2009 and are off 48 percent this year.